2015 Kaigler Children's Book Festival! We are only a few hours away from Day 1 of the Kaigler Children's Book Festival being held at University of Southern Mississippi. Last year was my first time attending the Festival and I couldn't wait to get back in 2015. In attendance each year are award winning authors and illustrators sharing their enthusiasm for creating children's books. Add in the teachers, librarians, school librarians, university students and professors, archivists and scholars and you have a Comic-Con for folks who are crazy for children's books! Here is a pic from the Book Festival FB page. They are stuffing bags in preparation for tomorrow! I'll present "The Power of Picture Book Biographies" at 4:15 p.m. on Wednesday. After hearing Leda Schubert speak last year about her book Monsieur Marceau, I became fascinated by picture book biographies or PBBs. 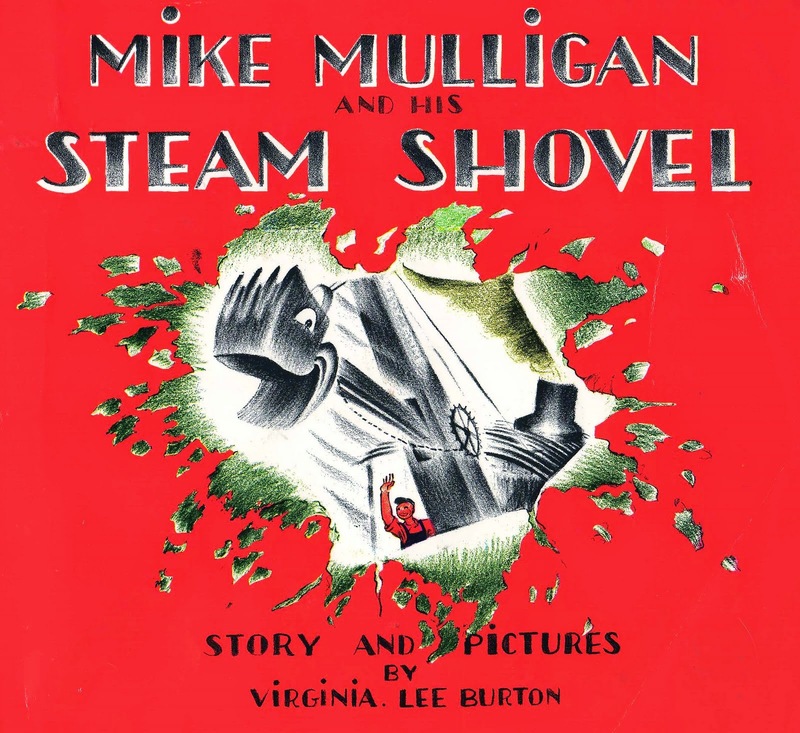 I read 50+ children's picture books to prepare for the presentation and there are some excellent titles to share. Among the best are books by the author/illustrator team of Jen Bryant and Melissa Sweet. This award winning duo created The Right Word: Roget and His Thesaurus that I will share with participants tomorrow. (Teaser: The word "thesaurus" means "treasure house" in Greek. 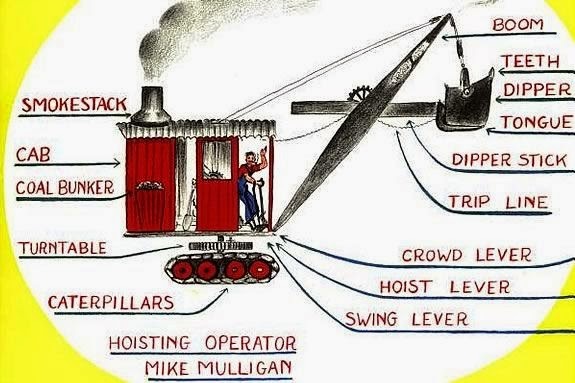 How cool is that?) Click here to view the book trailer for The Right Word. A few of the titles to be shared at "The Power of Picture Book Biographies" session. I'm very excited about meeting the authors and illustrators who will be here at the festival. Tomorrow I plan to track down Chris Barton and Don Tate, author and illustrator of the new book, The Amazing Age of John Roy Lynch, a PBB about a Mississippi slave who became a member of Congress. Well, better get some sleep. It's going to be a long, exciting day! I am gearing up for the Southern Early Childhood Association (SECA) annual conference which is being held in New Orleans this week. Attending conferences in the Big Easy is always nostalgic for me because that is where Hubby and I met 20 years ago. 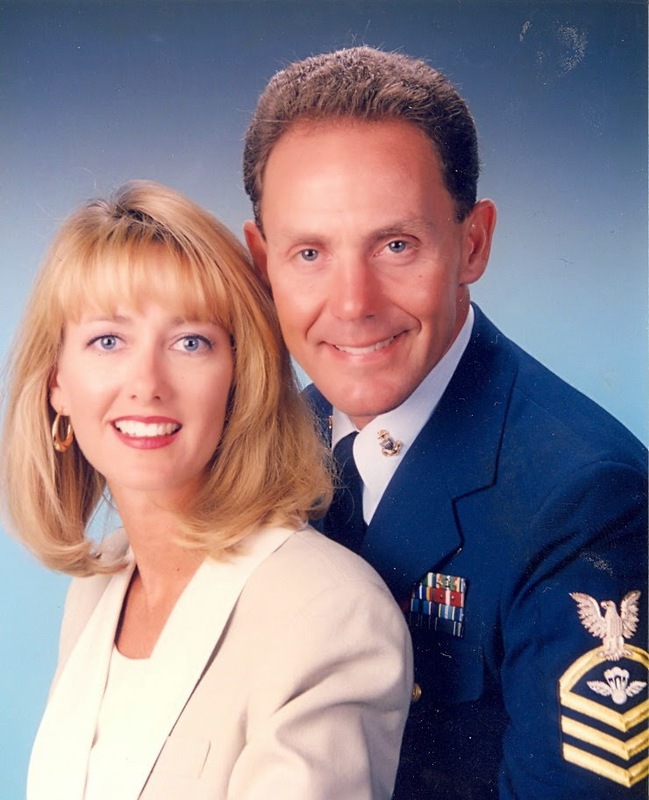 He had just been stationed there with the USCG and I was visiting from San Antonio to attend an early childhood conference. A mutual friend suggested we meet and less than 6 months later I nabbed him for good. Here we are in 1994. Boy, do we look young! So excited about the topic of my presentation! It has one of those long, dreary, educational sounding titles but basically it is on how to use children's literature to foster social-emotional development in young children. The audience at SECA is always the best. 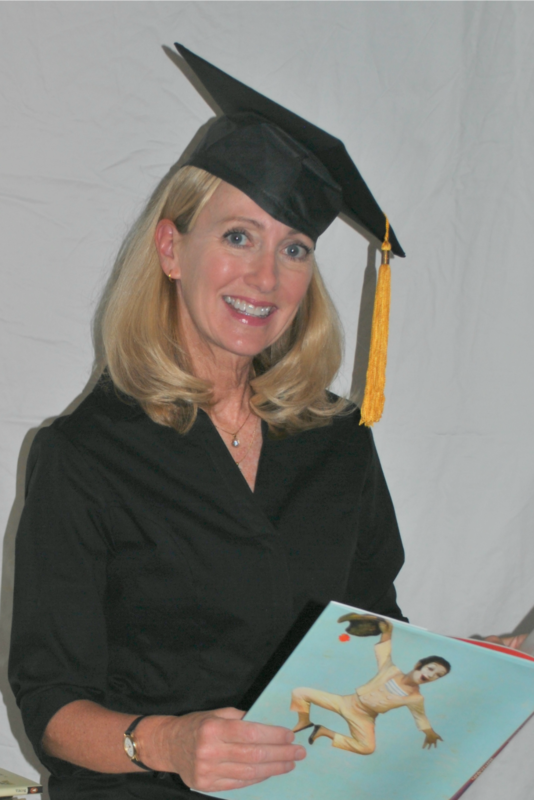 They are dedicated teachers and child caregivers who are enthusiastic learners. I'm also expecting to see some of my former students from when I taught at the University of New Orleans. Here is a preview of some of the titles I will be sharing at the conference. Bang, M. (1999). 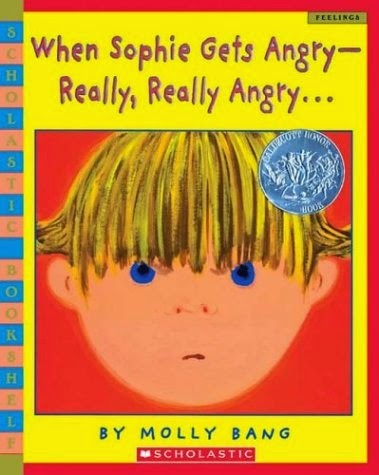 When Sophie Gets Angry- Really, Really Angry. New York, NY: Blue Sky Press. Children learn how to deal with anger in a constructive (rather than destructive) way. Gassman, J. & Horne, S. (Illustrator). (2012). 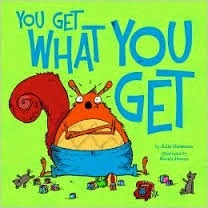 You get what you get. Capstone Publishing Company. Melvin throws fits when he doesn’t get his way but learns how to manage his emotions. Munson, D. & King, T. C. (Illustrator). (2000). Enemy pie. Chronicle Books. During summer, a young boy makes an enemy with a new neighbor, Jeremy Ross; however, his dad knew how to get rid of enemies using enemy pie. O’Connor, J., & Glasser-Preiss, R. (2012). 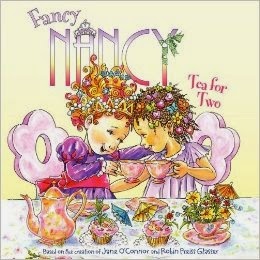 Fancy Nancy: Tea for Two. Harper Festival. Nancy is invited over to Bree’s house for a special tea party but they get into a disagreement and disaster occurs. Dewdney, Anna. (2013). Llama Llama and the Bully Goat. New York, NY: The Penguin Group. 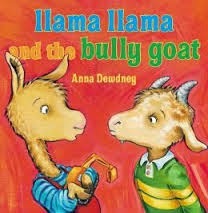 Bully Goat is teasing and taunting his classmates, but this story shows how the characters got through the difficult situation. If you read my blog, please find me at the conference and let me know! I'll be in the Bienville Room on Thursday at 9:30 a.m. and then in the Exhibit Hall with Pelican Publishing. Mark your calendars. Monday, September 15th is INTERNATIONAL DOT DAY! People from all over the world will "celebrate creativity, courage, and collaboration" all inspired by that small, round spot known as the dot. This day would not be possible without the award winning picture book The Dot by Peter H. Reynolds. 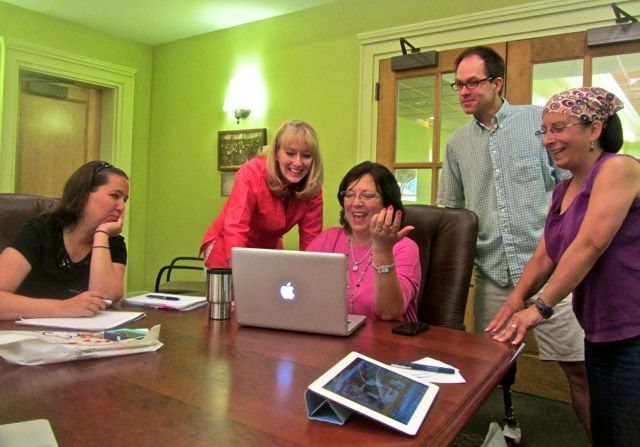 According to Reynolds, "The Dot more than anything celebrates the power of creative teaching." Since its publication in 2003, The Dot has inspired readers of all ages to step out of their comfort zone and take a chance. Like Vashti, the protagonist in The Dot, we are called on to find the courage to make a mark in our own lives and then pass on the encouragement to others. 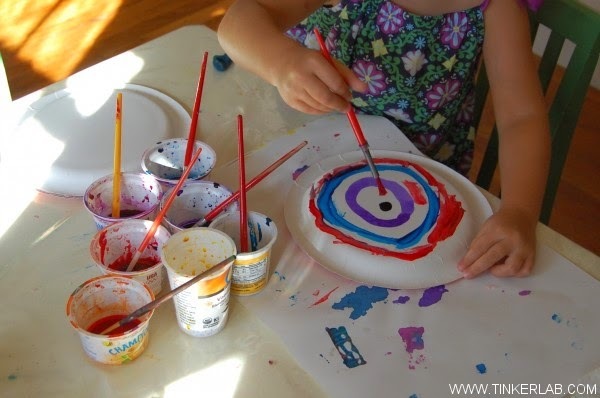 There is no shortage of resources on how to celebrate International Dot Day. A good place to begin is by downloading the The Educator's Handbook for International Dot Day. This 16 page book includes an introduction to International Dot Day, ideas for creative activities, and a printable picture frame to show off dot masterpieces. At The Dot Club, everyone is invited to register, join in the fun, and share their own ideas. Of course you will want to connect with other dot enthusiasts through social media including Facebook International Dot Day and Twitter @DotClubConnect and Pinterest International Dot Day/Pinterest. 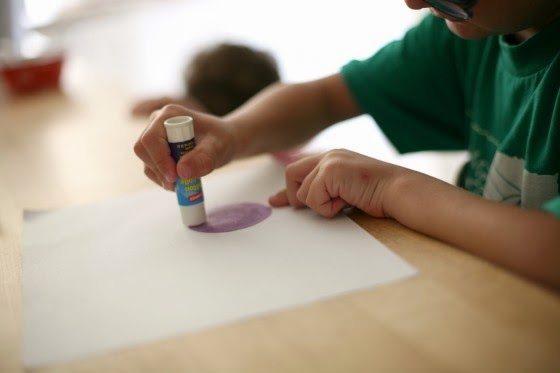 Here are some of my favorite dot art activities! Nathan Hale Public Library in Tulsa, OK. So in 2012, when our newspaper ran an article on the new trend of Little Free Libraries, it was like discovering the delight of a library card all over again! Imagine people building their own little libraries and offering books to friends and neighbors. Ben Franklin would be so proud. Like most brilliant ideas, the concept of Little Free Libraries began quite simply and grew into the phenomenon it is today. In 2009, Todd Bol built a birdhouse size replica of a one room schoolhouse as a tribute to his mother who was a schoolteacher. He placed it on a post outside his home, filled it with books, and posted a sign saying, "FREE BOOKS." Five years later there are an estimated 15,000 registered Little Free Libraries around the world. 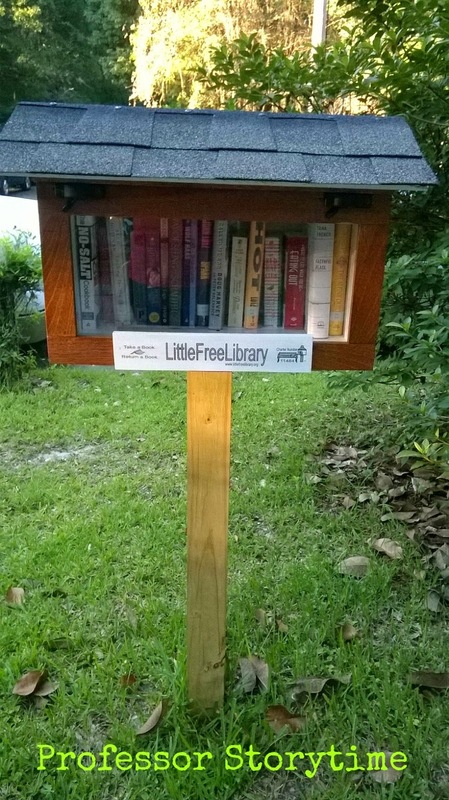 In my adopted hometown of Fairhope, Alabama there are three registered Little Free Libraries. 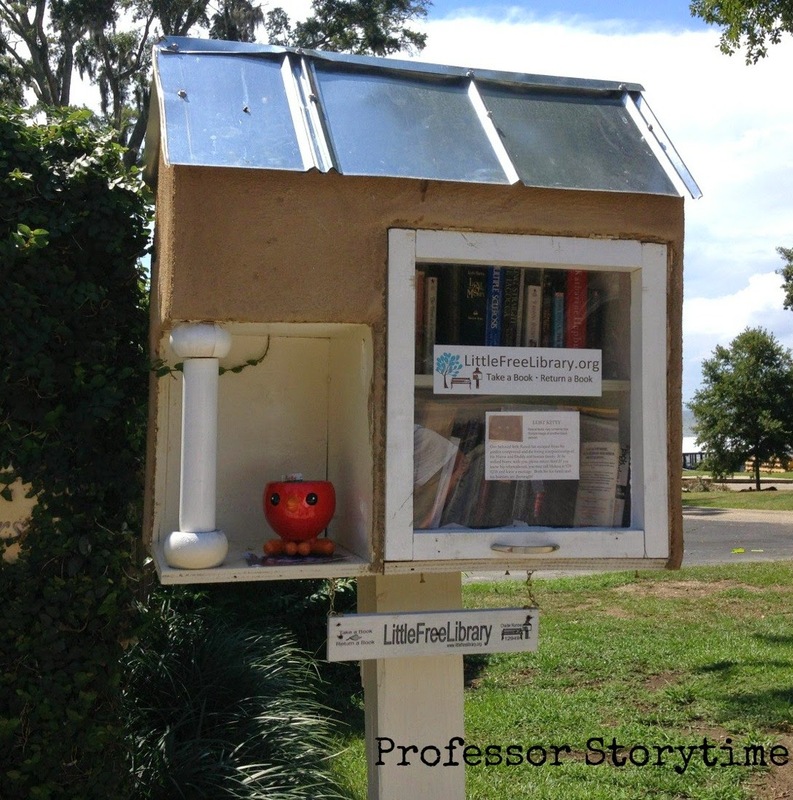 This Little Free Library was discovered while walking with a friend along the bay. A notepad and pen is provided to leaving a personal note. On our way to the 4th of July concert, we came across this Little Free Library. 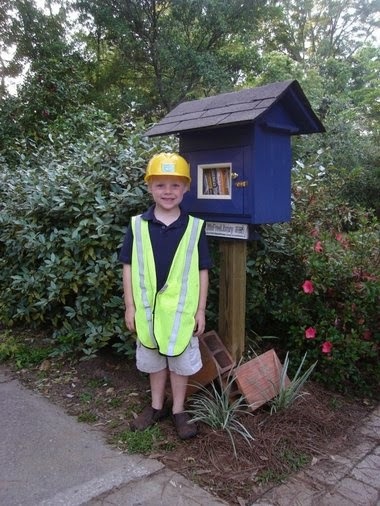 A five year old built this Little Free Library! You can read more about him HERE. Interested in becoming the steward of your own Little Free Library? The official website has everything you need to know to get started in the HOW-TO INFORMATION. 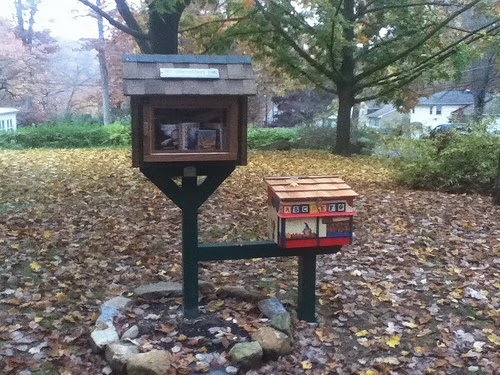 If you need inspiration, check out my Little Free Library board on PINTEREST. My favorites are those with a "children's section" like the one pictured above. For this past Mother's Day I asked for a Topsy-Turvy Planter which yielded exactly three edible tomatoes. Next year, I'm asking for my own Little Free Library and expecting a much more robust harvest! If you spot a Little Free Library in your community, please tell us about it here! The Amazing Fairhope Library: A Fun Place for Kids of All Ages! Photo courtesy of Fairhope Supply Co. 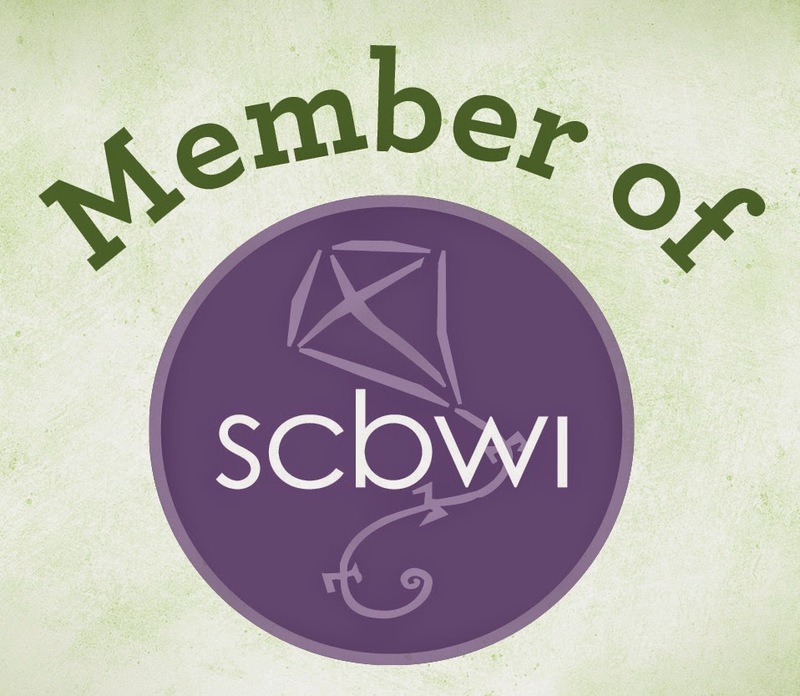 The August meeting of the Southern Bloggers Jubilee was held at the Fairhope Public Library. Blogging + friends + library = HAPPY! After our very informal show-and-tell style meeting, we were given a tour by Library Director Tamara Dean. My focus was on the children's area and the variety of activities offered specifically for toddlers, preschoolers, school-agers, and their parents. Take a look at just a few things the Fairhope Library has to offer! 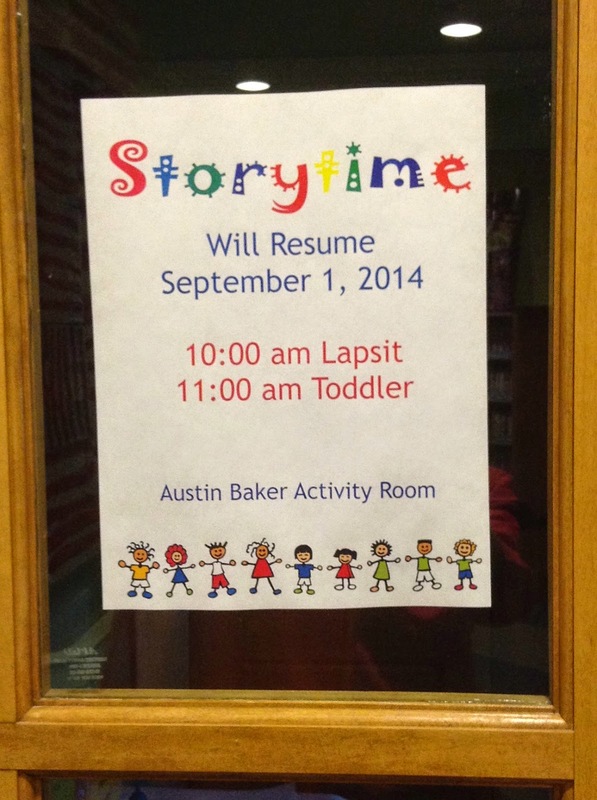 This sign makes Professor Storytime's heart soar! Parents can keep up with the schedule of children's activities by checking the library's online events calendar. Budding artists have a place to sit and create. There are comfortable places to sit and share a book. Audiobook versions of favorite children's books are available too. Children can look at illustrations while they listen to the story. Displays help young readers choose books. This front cover display has a back-to-school theme. The back wall offers a wide array of books on parenting. Placing these titles in the children's section is brilliant! 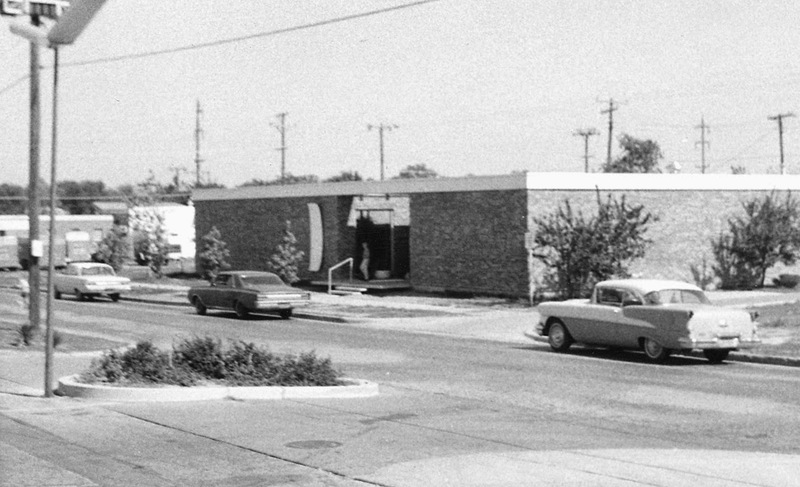 There is more to know about the Fairhope Public Library. Check out these blogs by others in our group! 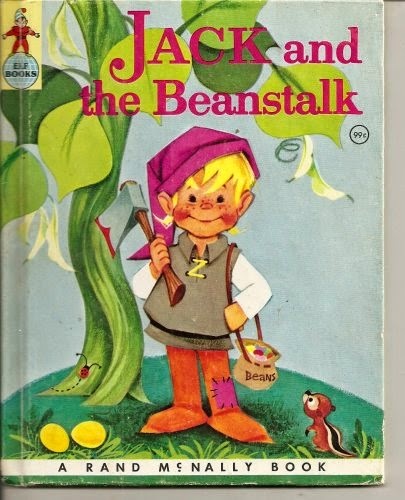 Jack and the Beanstalk is the most familiar of all the “Jack Tales” that have been told for centuries. Jack is depicted as a trickster who is often lazy and sometimes naïve, but who wins out in the end despite his character flaws. Jack and the Beanstalk has been categorized as a fairy tale due to the magical elements, and also as a folktale because it has been passed down for generations and adapted to reflect the culture of the storytellers. If the name of this story is even mentioned, my memories soar back to my grandfather reading this story at bedtime to my sister Nancy and me. He would hold a copy of the book but told it from memory. Of course, the highlight would be those fearsome words spoken by the fuming giant. As we got older, Nancy and I still asked for the story. We did want to hear Granddaddy tell it, but we also found it hilarious to watch him drift off to sleep halfway through the story while sitting in a chair! Reminiscing about my grandfather telling Jack and the Beanstalk brings back wonderful memories. 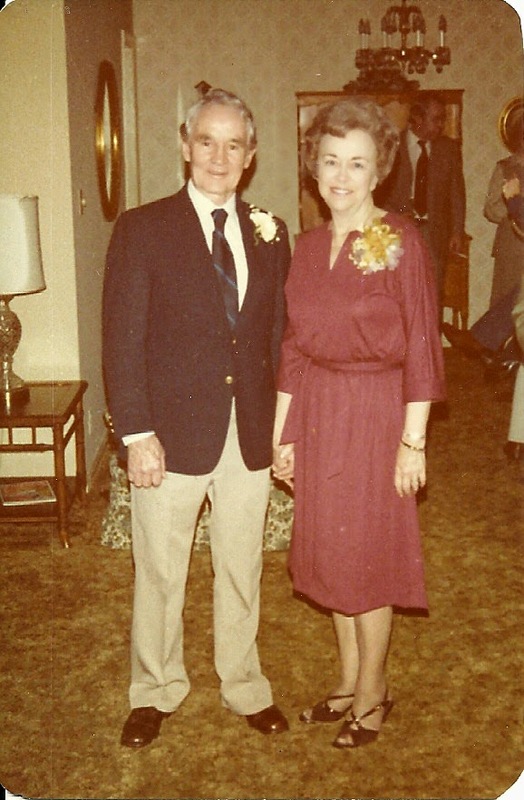 My grandparents Millard (the Jack & the Beanstalk Storyteller) and Natalie in 1980. There are many different versions of Jack and the Beanstalk and the story has a wide appeal. Because of the giant’s threat of grinding bones, this story may be most appropriate to children ages 5 and up. Here are some versions I recommend.